Random Ridiculous Rants: Sarah Palin has to give the money back! Stupid Russia, tricks are for kids. Sarah Palin has to give the money back! In addition to the stupidity of writing talking points on her hand and selectively choosing to become offended in regards to the word "retard" ... Sarah Palin is quite possibly guilty of any number of ethics violations. While governor she was charged with over 20 ethics violation, which she claimed left her with over 1/2 million in legal fees. And then some idiots (who for whatever reason work for her) raised a fund to pay for her defense. Problem is... she was still governor. This week a ruling from last year was upheld, specifying that the fund was illegal because it used her official position as governor to raise money for her personal gain. However, the independent counsel dispensing the ruling, gave Palin the benefit of the doubt, saying that she relied on bad advice from out-of-state lawyers. WHAT? WHAT?!?!?! Come on Sarah, I may not be brilliant, but I do know that it's bad to use public persona for personal gain. I mean you all but pulled a Rob Blagojevich here. Now what is really and truly disgusting here, is that though she has to give back $386,000 plus, she gets to KEEP anything made after she resigned. AND she has gone and set up a new fund. Seriously lady? You've made millions off your public stupidity, and now you want other people to pay for your bad behaviour as governor? Her lawyer told reporters she ran up the debts in public service, so a fund was justified. WHAT? WHAT!?!?! You ran up the debts, breaking the law, and committing ethics violations, that was not serving the public, that was dis-servicing the public! Seriously, why hasn't someone bought this woman a muzzle? She's so dumb it hurts!!! 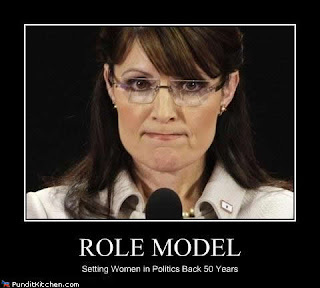 But somehow she found a niche in the political landscape and so far she has mostly endorsed winners (Rand, Perry, Haley, Fiorina) and in the process made herself a player on the republican side. Most people in the Ron Paul movement don't trust her and neither do I.